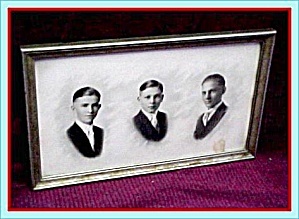 These framed photos show 3 young men from early in the 1900s. They appear clean-cut with fresh haircuts and neat ties/suits. The photo is mounted in a wood frame from the period that measures 9-in. by 15-in. The nails and heavy cardboard backing testify to the age of the piece. The wood appears to be oak that is painted and there are a few spots where the silver paint has peeled. It’s a good tight frame, though, and easily repainted. There is a small moisture spot at bottom right side below pictures, but we see no other defects.